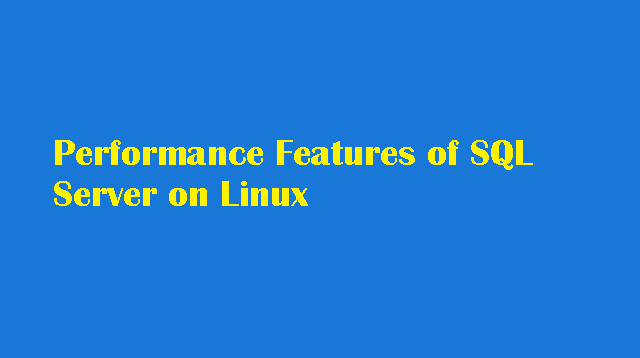 This guide will walk you through some of the performance features if you are running SQL Server on Linux . These are not unique or specific to Linux, but it helps to give you an idea of areas to investigate further. The following examples use the AdventureWorks sample database. For instructions on how to obtain and install this sample database, see Restore a SQL Server database from Windows to Linux. A columnstore index is a technology for storing and querying large stores of data in a columnar data format, called a columnstore. SQL Server provides In-Memory OLTP features that can greatly improve the performance of application systems. This section of the Evaluation Guide will walk you through the steps to create a memory-optimized table stored in memory and a natively compiled stored procedure that can access the table without needing to be compiled or interpreted. The primary store for memory-optimized tables is main memory and so unlike disk-based tables, data does not need to be read in from disk into memory buffers. To create a memory-optimized table, use the MEMORY_OPTIMIZED = ON clause. Execute the following query to create the memory-optimized table dbo.ShoppingCart. As a default, the data will be persisted on disk for durability purposes (Note that DURABILITY can also be set to persist the schema only). SQL Server supports natively compiled stored procedures that access memory-optimized tables. The T-SQL statements are compiled to machine code and stored as native DLLs, enabling faster data access and more efficient query execution than traditional T-SQL. Stored procedures that are marked with NATIVE_COMPILATION are natively compiled. Query Store collects detailed performance information about queries, execution plans, and runtime statistics. Dynamic management views return server state information that can be used to monitor the health of a server instance, diagnose problems, and tune performance.